Place sugar and 1 cup of water in a small saucepan, add mint. Cook over medium heat stirring until the sugar dissolves. Once dissolved remove from heat, cover saucepan and let sit for at least an hour to infuse. 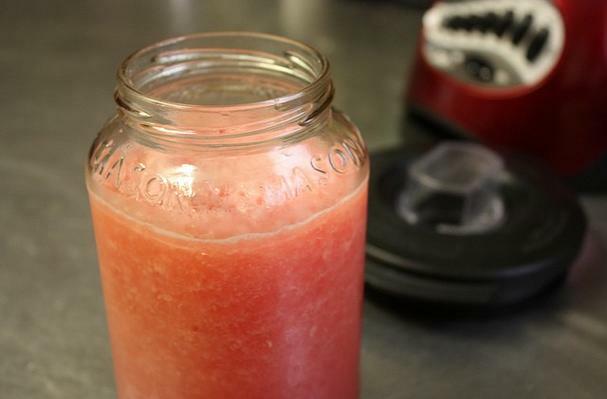 In a blender combine the lemon juice with cubed watermelon. Add mint simple syrup 1/4 cup at a time until the mixture is at your desired sweetness, about a cup. Pour the mixture into a large pitcher and add 1 cup of cold water, the gin and fill with the watermelon mixture. Stir to combine.